Painted in 1909, this has similarities to work by the French Nabis, Pierre Bonnard (1867-1947) and Edouard Vuilliard (1868-1940), and the Intimiste artist Henri Le Sidaner (1862-1939). It has elements of each in its composition (an interior looking towards an open window), its colouring, and in its use of a table laid with tea things and flooded with light. However, the brushwork is idiosyncratic; it differs in technique from Bonnard and Vuilliard, and again from Le Sidaner’s technique of pointillism varied by choppy, lively strokes. In the present painting the brushwork is used to model form, and the strokes are varied: long, layered brushmarks describe the floor and sofa, and shorter interwoven strokes the cushions and walls. Bonnard’s scenes and colours are reminiscent of this interior, but he employs an individual perspective, in which the whole room is tilted towards the viewer. This is an animated work, singing with light and colour; light vibrates around the still life of tea things laid on the table, and links the line of the sill with the sunny landscape beyond. The perspective is adventurous yet controlled, the floorboards shooting towards the horizon, and creating a tension with the stability of the furniture. A sophisticated painting, evoking an intimate domestic atmosphere and implying the presence of those who inhabit it. For further reading on the topic of interior paintings, please click here. The present artist seems likely to have studied with, or entered the circles of Bonnard and Vuilliard, or of Henri Le Sidaner; although the latter was a notoriously private artist, who faut de mieux became the reluctant head of a group of painters in the small town of Gerberoy where he settled from c.1901. 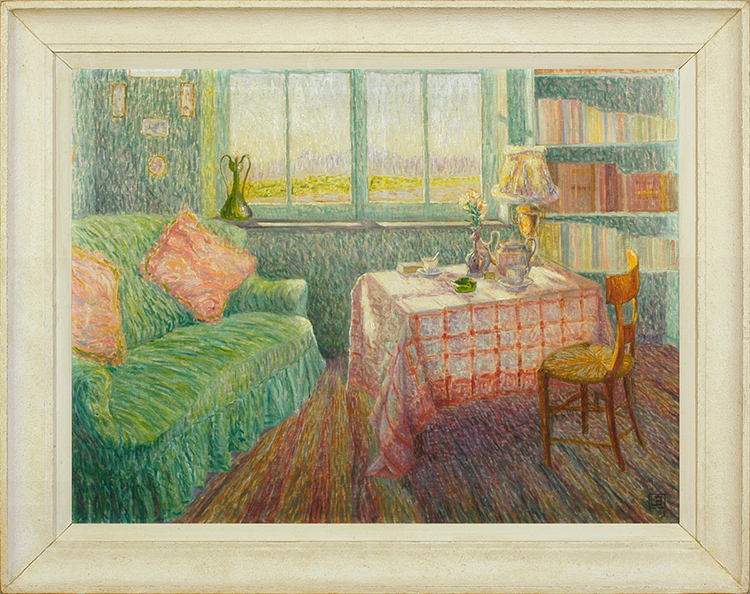 Painted in 1909, this has similarities to work by the French Intimiste artist Henri Le Sidaner (1862-1939), in its composition (the view of an interior looking towards an open window), its colouring (particularly in the combination of jade greens and rose pinks), and in its use of a table laid with tea things and flooded with light. However the brushwork is different from Le Sidaner’s technique of pointillism varied by choppy, lively strokes; here, the strokes are much more varied, using long, layered brushstrokes on the floor and sofa, and shorter interwovenmarks on the cushions and walls. The brushwork is also used to model form, in the chair and other furnishings, the vase and the books; Le Sidaner only seems to use longer, descriptive strokes when painting, for instance, flowing water (study for Le pont: Automne, Gisors, 1904, Waterhouse & Dodd, Dec.09). There are some similarities to another Intimiste artist, Edmond Arman-Jean (1860-1936), a contemporary of Le Sidaner and a painter in much the same mode. Some of Aman-Jean’s works use longer, descriptive brushstrokes as in the present painting, and some of them use similiarly fresh and colourful pastel shades; however, Aman-Jean does not seem to have produced any still life paintings. There are fewer similarities still to the work of Lucien Lévy-Dhurmer, whose brushwork is more regularly pointillist and blurred, and who is more overtly Symbolist. Ernest Laurent’s work is related in its brushwork, but his palette is very different, either using subdued and tonal pastel hues, or purer and brighter colours; the work of Charles Cottet is also only tangentially like this painting.